Basement Finishing & Remodeling | Home Renovation from Carver Construction | Carver Construction Inc. If you are looking to have your basement finished, or your unfinished basement remodeled, Carver Construction can provide you with a healthy, comfortable, and eye-catching living space. We provide basement refinishing projects that are quick, clean and within your budget and personal vision. All of our indoor projects are built to code and guaranteed to last! Improve your home by renovating your basement! Depending on your preferences and the amount of floor space in your basement, you can have it refinished for many uses. Your basement can serve as a second living room, an entertainment room, or a bar. It can also double as a workout area or second office. In addition to increasing the value of your home, you’ll be adding a new, modern family area or an entertainment room for guests. 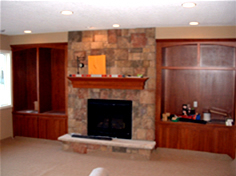 Let us provide you a free, detailed, basement remodeling estimate and consultation. Visit our gallery of home addition designs to see examples of how we can help you today!